We have served thousands of guests on San Diego sightseeing tours and hundreds of thousands of visitors who plan their own adventure using our online San Diego travel guide. The most common responses are “This place is beautiful” and “I can’t believe how much there is to see and do in San Diego”. Our goal is to help you find San Diego attractions that appeal to your interests, show you the most scenic areas of San Diego, and share with you its fascinating history and what it is like to live here today. Unlike most sightseeing tours, we provide both a driver and a guide. This allows our tour guides to provide you more information and interaction for a better experience. It also allows our guides to provide walking tours at scenic stops where the driver can drop us off to start our walk (and drive those who have a hard time walking) to pick us up at the end of our walk. Our public tours start and end at the conveniently located Santa Fe Train Depot, the main train station in Downtown San Diego at 1050 Kettner Boulevard, San Diego, CA 92101. We also offer private family and group tours, which can be customized to your interests. 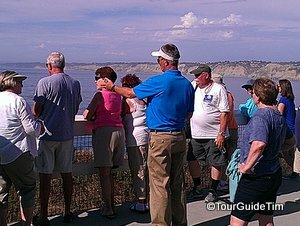 San Diego Coast Tour – Full afternoon escape to the most scenic coastline in the world while listening to stories of American pioneers who were attracted to this coastline for inspiration. Tour starts in downtown San Diego and goes north to Torrey Pines, La Jolla, Pacific Beach, Mission Beach and Mission Bay. Private Family Tours – We’ve handled families visiting from foreign countries who desired to set their own pace to couples referred by concierge services who wanted their clients to have the best experience possible. We can arrange a town car or join you in your car. Private Group Tours – We’ve handled everything from Boards of Directors looking for a couple hour break during their meetings to full day tours with college alumni groups. We can arrange a Mercedes Sprinter Van, mid-size bus, or full-size bus for your group. Theme-Based Tours – We are developing interest lists for specialized themed tours of San Diego from geology and birding to military and adventure tours. Unlike most websites, we don’t charge local attractions to be listed on our web site and we don’t skimp on the details of what they have to offer. That means you can find a full range of attractions on our website and learn the fascinating things to see and do at the attractions that cover everything from San Diego’s coastline to its mountains and desert. Our attractions are organized by location and by theme as seen in the right column of the web site. For each attraction, we tell you where it is located in relation to downtown San Diego and how to get to them by car or public transit. We also share with you what other attractions are nearby to help you make the most of your time in San Diego. Started in San Diego, where you learn about companies like WD-40 and Jazzercise that got their start in San Diego. Getting to Know San Diego, where we share our experiences touring the nuclear aircraft carrier USS Ronald Reagan and hiking down the cliffs to the secluded Black’s Beach. San Diegans in the Spotlight, where you can take a quiz to figure out if you know the famous actors who grew up in San Diego and learn about the elusive billionaire who drove the effort to create unmanned drones. In these and other categories, we or an occasional guest blogger will share what we find fascinating about San Diego to help you better experience this great place from the local beaches to the mountains and desert. Follow-us on your favorite social media outlet where we will post pictures of the places and activities that make us love San Diego. We’ll also pass along interesting tidbits, articles from other local media we enjoyed reading and think you will too, and an easy way for you to share things with us. Those of us responsible for entertaining visitors, whether we are tour guides, concierges, local historians, or managers of local attractions is that there is always more to learn about San Diego. Our city and county have so much to offer and it takes the effort of all to help spread the word of the interesting things we find about San Diego! Although we know a lot, there’s still a lot we don’t know so please reach out and share your stories with us. That is where the owner of TourGuideTim, Timothy Schenck, found himself for two weeks recovering from heart surgery in January 2008. It was the end of a trying period of time that started a few years earlier when he suffered a viral attack after traveling abroad on his honeymoon. With plenty of time to reflect during the trying times and culminating with the inspiration of a new beginning while enjoying spectacular California sunsets over a beautiful landscape from a hospital room, Tim decided he had to share the San Diego he knew with the world. Tim had always been surprised since moving to San Diego in 1998 from the East Coast that so few people seemed to visit the places in San Diego he found so fascinating. He had also been shocked to see so few tour buses around San Diego relative to other great cities he has visited around the world. He has explored towns and cities throughout Austria, France, Great Britain, Germany, Czech Republic, Australia, and countless others. But, for some reason, people just seem to be missing the boat on San Diego. People know about San Diego’s great weather, the Zoo, and SeaWorld but these great attractions are just the tip of the iceberg of what visitors can enjoy in San Diego. Even many native San Diegans were not aware of the places Tim would find while exploring every corner of his new hometown from the ocean to the mountains and desert, nor were they aware of the unique history of San Diego that Tim would read in books from the San Diego Historical Society, where his wife volunteered as a proofreader. So, while Tim had plenty of time to reflect as he recovered from his ailment, he decided it was time to put away his CPA license and take his attention to detail and his passion to do things that make people say “Wow” and apply it to the promotion of the unique aspects of San Diego. It was time to let the world know that there is much more to San Diego than meets the eye. San Diego is full of tourist attractions that would be famous had they been located in almost any other city instead of hiding in the shadows of San Diego’s more famous attractions that have withstood the test of time. Little attention has been given to the fact San Diego has much more than just sun, sand, pandas and Shamu. So, start exploring this online travel guide, which currently describes over 250 attractions, with many more still to be added. There is something for everyone. You only need to start looking to find the attractions that will appeal to your heart. Don’t just go where everyone else goes. Otherwise, you will miss out on some great lifetime memories. For those who want a more hands on experience and the opportunity to go behind the scenes where few people have gone before, join Tim and his fellow TourGuideTim experts who are passionate about San Diego, have good personalities, enjoy sharing knowledge of the local area and strive to make people say ‘Wow’ as we personally show you the best of San Diego. Let us be your friend in San Diego. TourGuideTim Inc. or its owner and guide Timothy Schenck is a proud supporter and member of the San Diego Tourism Authority and the following organizations. We also support local non-profits such as the Ocean Beach Woman’s Club and the Coronado Historical Society by providing certificates for free tours to use in their fundraising efforts.